SEATTLE — Self-identified witch Kay Clark was “burned” in the comments under several of her recent Instagram posts in the past week, a visibly shaken source reported. Clark’s mother, Andrea Clark, is confident the witch lifestyle is just a fad her daughter will eventually outgrow. 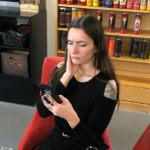 At press time, the younger Clark was seen writing out a caption to her latest Instagram post, composed entirely of emojis and intended to banish “haters” from her profile. Photo by Patron supporter Belle De Nuit and photographer Haleh. The post Instagram Witch Burned in Comments appeared first on The Hard Times.